Yes, we have a very special hay. A hay for rabbits is not only species-appropriate, but also contains many important nutrients. It is, of course, easy to claim this alone. This statement is supported by scientific data. This is the reason, why we decided to fully analyze our hay and to make the results available to our customers. Sensory evaluation is understood to mean all examinations, which can be carried out with the available sense organs (see, smell, feel, taste, ..). The hay is green and has an aromatic intense smell. It is free of mold. The dried plants are from well to very well preserved and thus have a higher proportion of leaves compared to normal hay. This indicates that the hay was only little machined and transported. There are no brown plants. These would point to overheating during the drying process. Grasses are predominant, and the stems of the plants are not overly lignified, which indicates an early cut-time. Hay is a natural product, and therefore the values of the reference sample are subject to natural fluctuations. 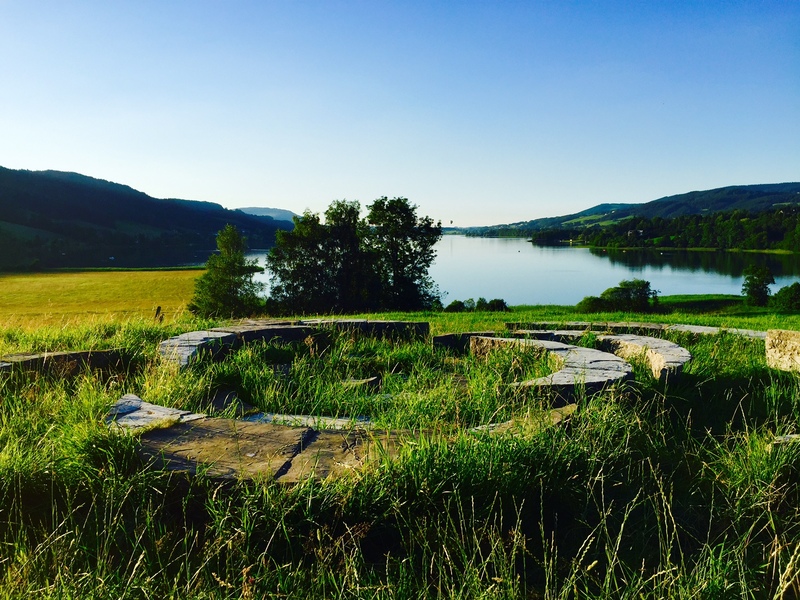 Hubertus-Hay is produced ONLY by the evergreen meadows. The fluctuations are therefore small, and this is the nature. Crude fiber is not equal to crude fiber! The crude fiber content in itself does not say much about the benefit for the rabbit. Only the composition of the cell wall components provides information on the digestibility of the hay. Crude fiber consists of cell wall substances cellulose (difficult to digest), hemicellulose (easily digestible) and indigestible lignin. For good digestibility, the total cell wall content (NDF content) of the crude fiber must not be too high. Our premium hay for rabbits is relatively low at 511g / kg TS, indicating a good digestibility. By comparison, the content of hay is normally well above 600g, while that of green food is 550g / kg TS. The composition of the scaffolding substances (plant fibers) ensures a good feed acceptance and prevents digestive disturbances. Rabbits select their food against lignin and cellulose (ADF content), with a small portion of it being needed for intestinal health. The ADF content in our premium hay is comparable to that of fresh green food and thus ensures good feed acceptance, good feed utilization and good digestibility. The adequately containing indigestible fibers promote the intestinal peristalsis (movements of the intestines, which support the transport of food in the intestine) and thus prevent digestive disturbances. Values for hay are around 400g, which for fresh green food is by 330g/kg TS. Here a very good value is shown for the premium hay at 286 g/kg TS. A low ADL content ensures good utilization of the cell wall components by intestinal bacterias. The older the plants become, the more they get lignify. Responsible for this is the indigestible lignin (ADL) for rabbits. A too high lignin content hinders the recovery of cellulose and hemicellulose (ADF). Hubertusheu contains many valuable vitamins and minerals. Our premium hay is at the bottom with 39g/kg TS, which ensures a good usability of the cell wall components hemicellulose (for energy production), and partly also the cellulose by the intestinal bacterias. Typical values are between 40-60 g/kg TS. 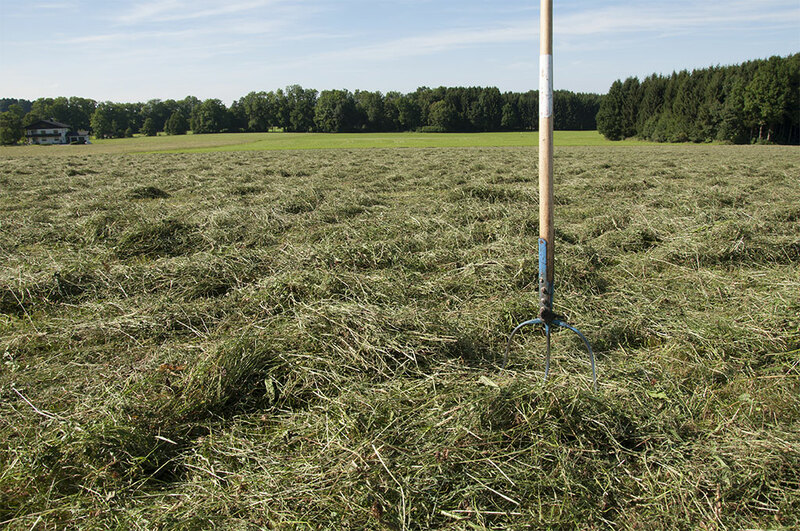 The digestible energy of the premium hay reflects the composition of carbohydrates. It corresponds to 10 MJ / kg of TS the recommendations, which corresponds to the maintenance requirement of house rabbits, and for a hay it is unusually high. This also speaks for its very good quality. The content and especially all the composition of polyunsaturated, essential fatty acids provide protection against inflammatory diseases and support the immune system. It has long been known that a approximately balanced ratio of the essential fatty acids is important for inflammatory diseases and the immune system. Anti-inflammatory (Omega-3 or linolenic acid) and anti-inflammatory (Omega-6 or linoleic acid) essential fatty acids should balance. Not the amount, but the composition is important for the immune system. In our premium hay, the ratio is n-6 : n3 = 1 : 2, which is very good, because it is almost the ideal of 1 : 1 corresponding. Our premium hay contains a natural vitamin D content due to sun drying of the plants. It is only formed by the UV-B radiation in the plants when drying. Typically, plants do not contain Vitamin D,. There are a few exceptions, e.g. Red clover and alfalfa. 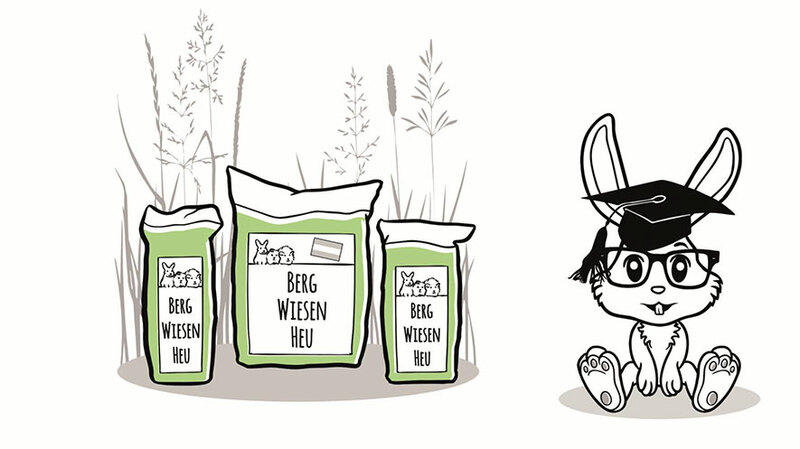 In dry foods, this vitamin is added separately, but with our hay it receives the rabbit in its natural form. Vitamin D (in the effect it belongs more to the hormones) plays a very important role in the Calcium/Phopshor metabolism. These minerals are needed for strength of the teeth and bones. A deficiency of vitamin D will inhibit the incorporation of calcium and phosphorus into bones and teeth, which can lead to dental and jaw problems. Examples are “soft” jawbones, which can lead to abscesses and defects, and lack of tooth growth, which are very common diseases in rabbits. 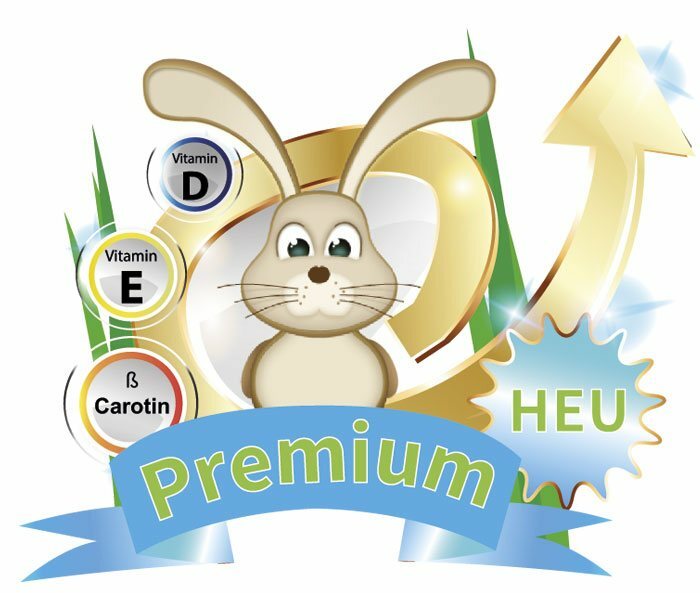 As a possible reason for a deficiency of vitatmin D in domestic rabbits could be a lack if there is no possibility to offer rabbits access to the natural sunlight and no dry feed is offered with vitamin D3 addition. Vitamin D is also important for the immune system. It improves immune system performance and inhibits autoimmunity (response to body antigens). Near the Salzburger Salzkammergut on the front of the Alps grows our hay for rabbits. ß-Carotene is the precursor for Vitamin A. Now the vitamin A is added in very high quantities to commercially available dry feeds. Natural β-Carotene cannot be overdosed, since excess carotene is stored with the skin and is gradually disposed of with the urine. This Vitamin is needed to build, protection and the regeneration of skin and mucous membrane. It increases the resistance to infections, increases the formation of antibodies and is involved in the metabolism of carbohydrates, proteins and fats. 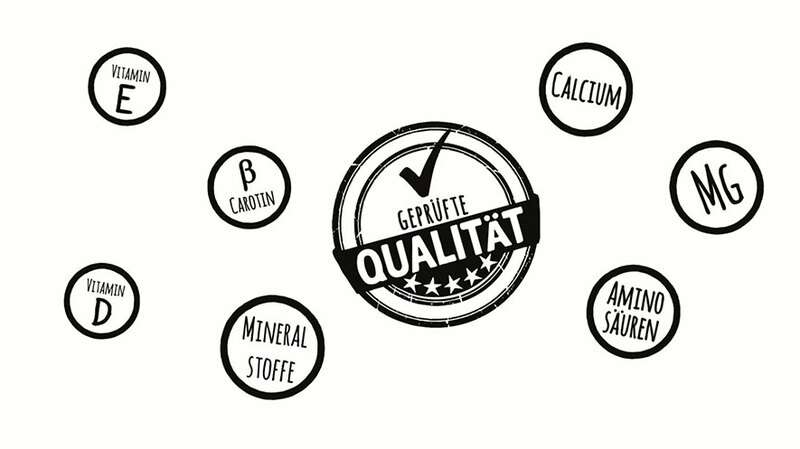 (ß-Carotene: The value for the premium hay is with 62 g / kg TS twice as high as the usual average). Vitamin E is a natural antioxidant. It prevents the formation of free radicals and thus diseases and has an influence on protein synthesis. It has an antitoxic effect in cell metabolism, prevents liver necrosis and muscle degeneration, regulates the hormone metabolism, maintains the stability of the membranes, especially the heart and skeletal muscles, and stimulates antibody formation (better resistance to disease, immune system). Sulfur-containing amino acids ensure a natural acidification of the urine and can thus protect against urinary stones. The essential, sulfur-containing amino acids methionine and cystine guarantee a good utilization of the entire protein. The values for Ca, P and Mg are almost determined as ideal and should help owners whose animals are struggling with tooth or urinary problems (stones), making the decision for this hay as a supplement in the diet easier, as well the amount as also the ratio of the minerals to each other, that fit very well to all recommendations. If the phosphorus content in the diet is too high, then calcium is dissolved from the bones and teeth, if it is too low, then the incorporation prevents the calcium in this. The analysis, evaluation and interpretation are exclusively related to the product Hubertus-Hay. 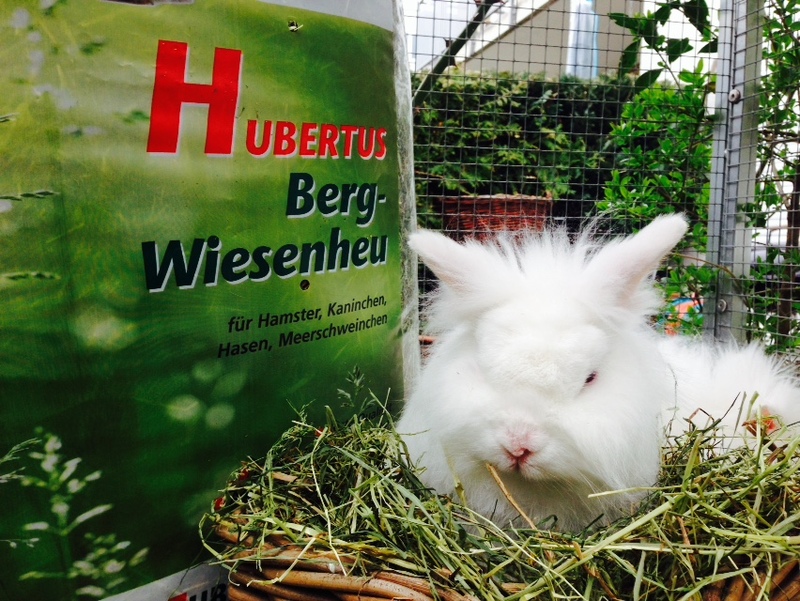 The hay from the product Tiroler Heuhaus is not analyzed to this extent! However, due to the high quality grasses and herbs as well as the very similar harvest and drying conditions, a similar result can be assumed, however, this is not supported by a feed analysis based on facts. Would you like to learn more about rabbits and guinea pigs? All about the healthy diet of rabbits and guinea pigs. An external interpretation of the results by a specialist was also important to us. What are tables with numbers when these are interpreted incorrectly or “suitable”? With Andreas Rühle, who runs a website about rabbits, we were able to win an independent expert for this task. The following interpretation was written by Andreas Rühle, reworked by us with the goal of making the text more comprehensible (Who of us is already a scientist?) and was checked again by Andreas Rühle for professional correctness). Andreas Rühle interpreted the results of the analysis as an external specialist. Andreas Rühle is born 1964 and has been dealing with the animal-friendly attitude and nutrition of rabbits for more than 15 years. From the experience with a small breed of dwarf rabbits in free-range keeping and largely kind-type food resulted in 2009 the book „Rabbits would buy meadow (Amazon link)“. He occasionally publishes articles in journals, assists scientists, and mainly advises rabbit attitudes, whose animals have often been regarded as exempted and abandoned by veterinarians. The critical treatment of well-established specialist opinions results from a long-standing, extensive study of the subject literature and is supplemented by one’s own experience. For many years, he has been observing and documenting the life-style of wild rabbits in their natural habitat. 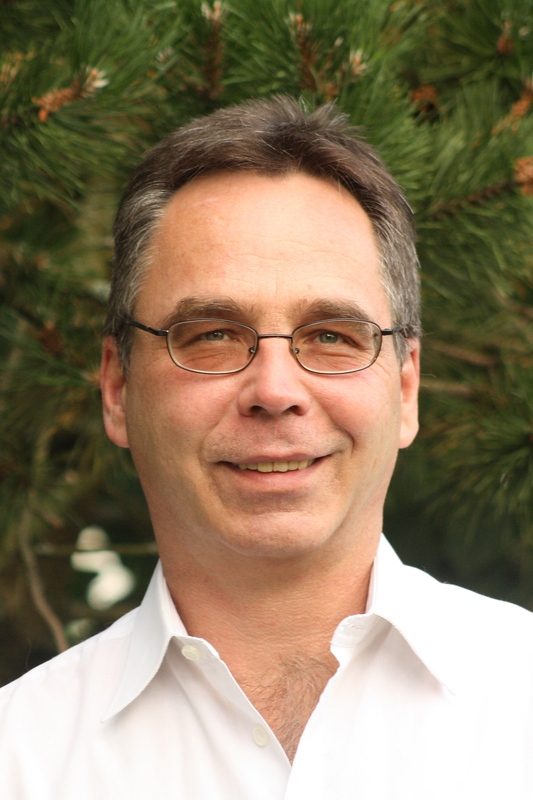 Andreas Rühle works in the automotive industry as a member of the “Research & Development” and “Quality Management” and lives with his family on the edge of the northern Black Forest. On its website are many other interesting information to find about rabbit nutrition and attitude.